Krazy kitties know how to go wild, letting fur fly as they live each day their way. 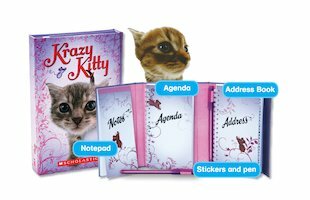 It’s time for you to take charge just like these cheeky rascals – with the help of this adorable planner. When you open up the decorated trifold, you’ll find a diary and address book, plus a notepad for jotting down all your secrets, plans and thoughts. There’s a pen and fluffy stickers to keep you purring too… so plan your day the Krazy Kitty way!